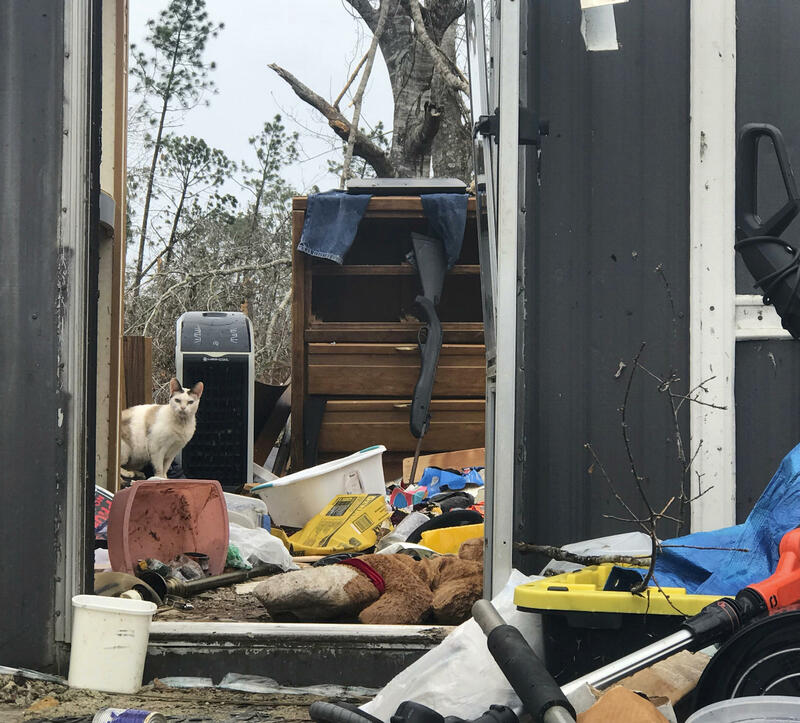 Mark Ward surveys the destruction of his neighbor's mobile home in Bay County, Fla. Ward and his neighbors say that the rural parts of the county have seen little help since Hurricane Michael. Mexico Beach Mayor Al Cathey attended the event saying 80% of his city was destroyed in the hurricane. "You know when you dance you got to play the fiddle," he said. "We live on the coast of Florida, I have watched for years people in Alabama, Texas, Miami an I thought oh my goodness I hurt for them." Cathey says the city has a $50 million debris bill with an annual budget of just $3 million. "You'd think it'd be 155 mile per hour winds with 17 and half feet of water. The largest documented storm on the coast of Florida but that's what we got so we deal with it and we move on." Cathey says Governor Ron DeSantis' recent announcement on Hurricane Irma relief funding concerns him. FEMA Media Relations Specialist Leo Skinner says federal agencies have supplied more than $1.1 billion in grants, loans and claims from their flood insurance programs. "So all together FEMA can't do it by itself. There's no way that we can just come in and get people back to the way they they were before. But to other federal agencies and local communities I think we do a fairly good job of providing the support people need." FEMA has put more than 2,000 households in hotels through a Temporary Shelter Assistance program and will continue giving their best efforts to help victims. The program recently expired. Some 42 families received a 60-day extension though the state had requested 90 days. Bay County Commissioner Philip “Griff” Griffitts says Bay County residents feel like they’ve been forgotten about. Griffitts says there haven’t been enough efforts made from United States Congressmen. The Associated Press recently reported a $14 billion aid package sought by Florida and Georgia is stalled in Congress amid disputes over funding to Puerto Rico. President Donald Trump is at odds with leaders of the island territory. "I'll fly him down here. I'll pay for it out of my pocket to fly a congressman, if he wants to see it, come on down. I'll take you on a tour six months later and show you what devastation looks like." He says he is proud of the efforts that have been made. He also says the estimated damage assessment is around $661 million and they have a long way to go. "I think everybody is a little worried. We're kind of living in an unknown, it's a purgatory,somewhere between heaven and hell I guess." Griffitts says they preformed the largest debris removal done by a county in American history. The idea of the Pray for Bay event was to show community members, though they may feel otherwise, they are not being forgotten about.